There was a celebration in Denver of a culture more than 8,000 miles away on Sunday — it was the annual Taste of Ethiopia event. Denver is popular destination for Ethiopian immigrants because of the climate similarities. At 8 a.m. Saturday morning, a volunteer team of Ethiopian cooks will gather in a commercial kitchen to make eight dishes traditional to their East African culture, enough to feed about 2,500 people. Surrounded by mounds of ingredients — including 300 pounds of onions, 300 pounds of beef and 400 chicken drumsticks — they’ll cook throughout the day and into the evening. Crowds at the Taste of Ethiopia rapidly multiplied each year since it started in 2013, and this year a new global audience gets a chance to try such classic dishes as doro wot, a chicken stew, and tibs key wot, a beef stew with red chili pepper. For the first time, the Taste of Ethiopia will host the most American of ceremonies, in which immigrants from 18 countries — ranging from Nepal and Bulgaria to Guatemala and China — will take the oath of allegiance and become U.S. citizens. 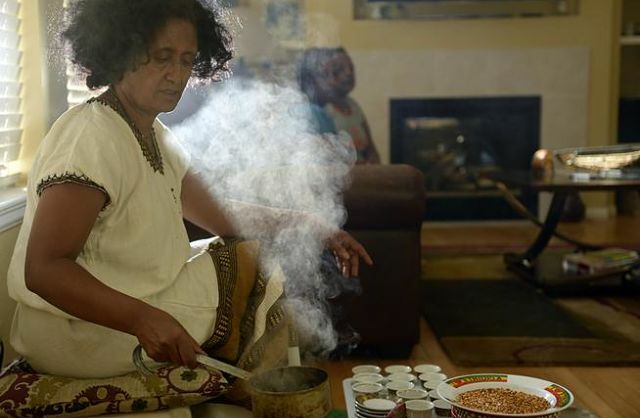 On a recent afternoon, a group from the Ethiopian community gathered for a traditional three-cup coffee ceremony, which will also be part of the upcoming festival. Sosena Dagne roasted coffee beans in a pan over a hot flame, then ground the beans and made a strong, rich coffee. Coffea arabica — the coffee species savored by most of the world’s population — originated in Ethiopia, and the coffee ceremony is centuries old. These pieces of Ethiopian culture are eagerly shared by people like Dagne, who came up with the idea for a festival celebrating her native country, which is located in the Horn of Africa.